For Quentin Madden the former interior designer and part-owner of Palazzo, the stylish interiors shop in Toorak. Following destruction of her earlier house in the Macedon bush-fires, the work involved site selection, schematic design, costing, model-making, design development, building permit, contract documentation, contract supervision and construction by our firm Urban Spaces, Builders. $310,000 (1985-86). I met Quentin through Donald Green. The design of her new house was to be Palladian in proportion and configuration, and derived from some early colonial stables she knew in Tasmania. I had not visited the Veneto then, but the siting and design relates to Andrea Palladio’s Villa Barbaro, Maser (c1560,) which is also ‘pushed back against the hill’ that is densely forested, with a backdrop of low forested mountains, and facing a sweeping open long view. 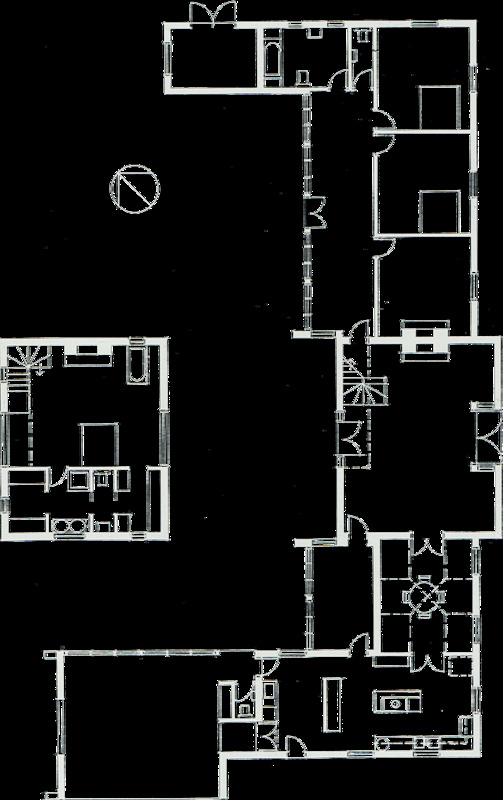 Also, one approaches the villa from the right (east), seeing the façade only in an obtuse side view. It comprises a frontispiece block, projecting from wings, which run at the rear to partly enclose a courtyard. As we chose the site, snow began silently falling. The name derives from: Winnie-the-Pooh, who also lived in a forest all by himself under the name of Sanders. Both Sander’s Wood and Villa Barbaro are served from a complex on-site water reticulation system, derived from a sunken cylindrical reservoir tank set into the forested hillside behind.